Here at Celebration Church our Kids rooms are used as multipurpose rooms throughout the week. Sundays they are strictly used for our kids environments. That could include a full worship band all the way down to just a single vocal with a backing track. Mondays are for groups, which normally just use a couple microphones; the rest of the week sees student chapels and worship rehearsals and, of course, more groups! With these rooms being used so much we knew we needed a console that was easy to use, one our volunteers could feel comfortable and conﬁdent when running, with an easy to understand layout. We’ve experimented with a few consoles in the past that just didn’t make any sense for us – we knew right away that they would only confuse new volunteers. However, with Yamaha’s new TF3 digital mixing consoles, we found everything we were looking for in a perfect ﬁ t for our kids’ rooms. At Celebration Church volunteers are very important. All of our services and groups are ninety percent run by volunteers. We are always gaining new volunteers and that requires training. The Yamaha TF3 has a lot of features that make it so easy for us to train and for our volunteers to use. We really liked their Quick Pro Presets. They had presets for everything, and these presets made adjustments to the EQ, compressor and other things, as well as names and color tabs, very easy for new volunteers to get started with, and also speeds things up for our volunteers that have been on the team for a while. It gives them a good starting point to make adjustments, instead of starting from scratch. The one knob compressor and one knob EQ also stood out to us. We really experimented with these during our Tuesday worship rehearsals. We have multiple drummers, guitarist, bassist and vocalist constantly switching out during rehearsals, and need to be able to make adjustments per musician. The one knob EQ and compressor makes things really fast and easy to dial in. Both EQ’s and compressors have multiple parameters to adjust and take time to dial in, but the Yamaha TF3 provides one knob to make all those adjustments. It also has the other parameters, but the one knob function was a huge beneﬁt to us. These functions just made it easy for us to show our volunteers how to get a fast and easy head start to dialing everything in. With these rooms being used for multipurpose, we also wanted a console to be easy to understand. We wanted the layout to be straightforward and user friendly. The Yamaha TF3 layout is not only easy to understand, it is extremely efﬁcient and makes the workﬂow so much faster. We like that everything is visible on the console. It has a digital strip to name all the channels and color code everything to make it easier for volunteers to ﬁnd the instrument or vocal that they are looking for. The console also has a sweet little touch screen at the top that displays all the parameters and functions of the channel selected. We feel like it is impossible to mess up something on this console. Everything is visible and laid out to be seen. Unlike other consoles in this price range, nothing is hidden or bunched up, which makes things hard to ﬁnd. We also really appreciate the Sends On Fader buttons on the right side of the console. We run all in-ear monitors in the rooms because of their size, and want as much control of the sound as possible. Like I mentioned earlier, we have to make a lot of adjustments to help the worship team hear what they like because every musician has a different preference on what they want to hear in their in-ear mix. The Sends On Fader buttons offer a fast and easy process to make all these adjustments, and it was easy to show our volunteers how to use this function. They picked it up really fast with no hesitation – they simply need to select the aux mix they want to adjust and the motorized faders show them exactly what is in the mix. 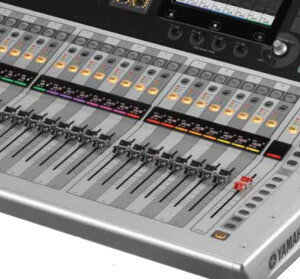 They just move the faders to the preferred level the musicians are asking for and they’re done. It doesn’t get much easier than that. 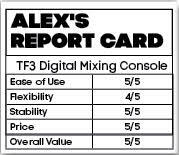 Overall, the Yamaha TF3 is a pleasure to work with. It has the user-friendly layout we wanted, and is super easy to use and train our volunteers with. I think it’s a great console for every small to medium size venue. Not only was I happy with it, but so were all of our volunteers, who were pleased with how easy it was to work and impressed with how smooth the transition was to working with this new console. I deﬁ nitely saw a difference in all the trainings with the new volunteers. They all picked up it up so quickly, and really understood all the functions and were able to dial everything in a lot faster than before. Celebration Church gives Yamaha a thumbs up for making a console so easy to use and understand and unique features that make audio easy. Alex “Flaco” Flores, is the Audio Coordinator at Celebration Church, running FOH for all services and conferences, as well as anything involving audio at Celebration’s multiple campuses. He is also responsible for building their audio team.